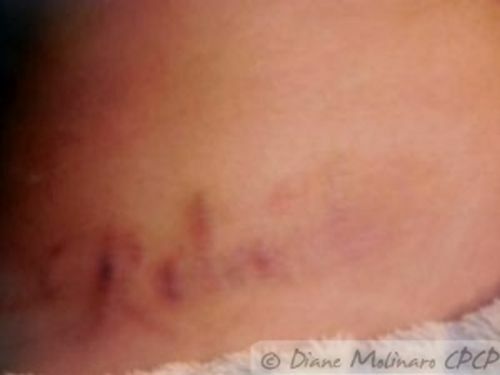 The saline tattoo removal solution is applied to the skin In the same way that the pigment was originally placed. 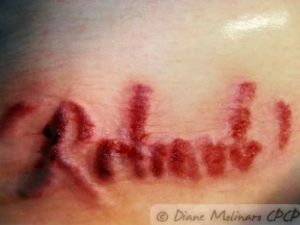 The lightening/ tattoo removal solution creates a scab over the application area that will fall off by itself, as the skin heals naturally. The new skin is revealed after the scab falls off in it’s own time. During the healing process the unwanted pigment attaches to the scab and effectively pulled up and out by the scab. The healing is a natural process which requires that the scab be kept dry at all times until it falls off naturally. The process can be repeated if necessary to remove any remaining pigment. An amount of time to fully heal & recover the skin between sessions to prevent scarring. This depends on many factors and Diane will be able to advise a program best suited to you. Full lightening can require 3-5 sessions, possibly more. “Lightening “ pulls out pigment layer by layer, so the more times pigment has been placed in the area, more sessions will be required to pull it all out. Sometimes if “partial lightening “is all that is required, one session may be all it takes. 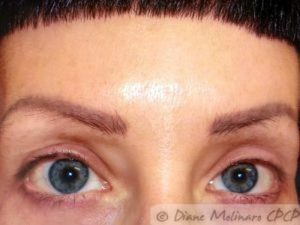 A full consultation is required to see if you are a candidate for “Non-laser” Pigment Lightening. You will be given COMPLETE instructions on how to care for your procedure, before AND MOST IMPORTANTLY, AFTER the service!! You will be instructed what you will need to purchase for your aftercare and how to keep area DRY during showers. Everyone may not be suitable for this service. The more melanin in the skin poses a risk of “hyperpigmentation” (skin becoming darker after healing). Pricing for this service varies according to size of the area(s) to be worked. Minimum amount for set up is $150.00 A price will be determined at consultation, for each individuals service. 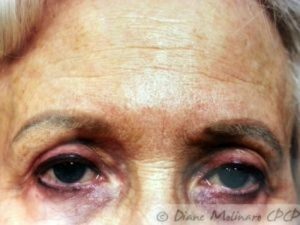 Sometimes it is necessary to “lighten” existing pigment in order to be able to accomplish a successful “color correction” of existing pigment. If the existing pigment is too dark, a color correction may yield a too dark of color, if new desired color is a lighter one. 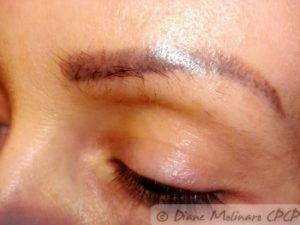 Also, if there is more than one color to be corrected, the lighter the existing pigment can become, the better for correcting. 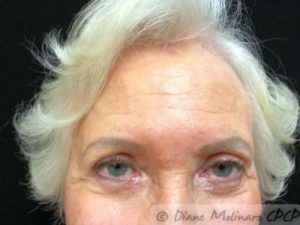 Full lightening is necessary when existing pigment color is wanted to be completely gone. I had a fabulous day today! ! 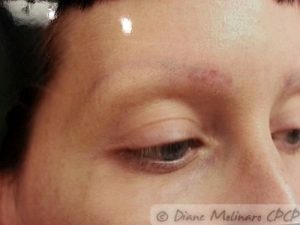 My lovely client got NEW brows after only ONE removal treatment with A+Ocean Hypertonic Saline Solution!! It was a real pleasure working on her!! 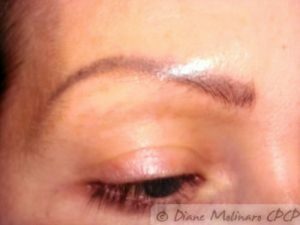 My client now has NEW brows after only ONE lightening treatment with A+Ocean Hypertonic Saline Solution by aplusocean.com. Today was my clients "final photos" day!!! Soooo happy with her outcome! ! Diane is now a “Certified Trainer” of the John Hashey A+ Ocean Hypertonic Saline Removal Method. All removal procedures will be done with A+ Ocean. 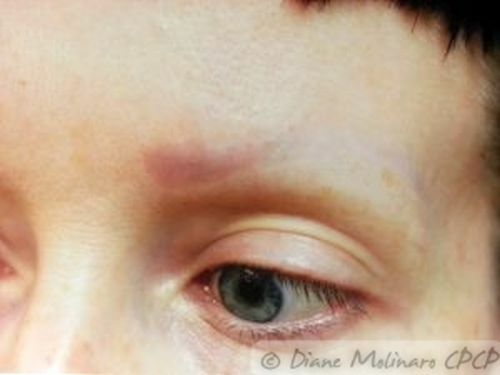 Below you can see some examples of “Partial Lightening” and “Full Lightening” of unwanted existing pigment in the skin. 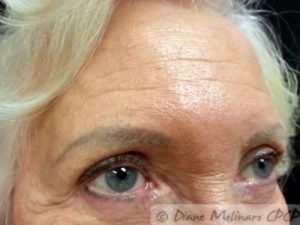 First example is a lady who came in presenting with two different colored ,faded, existing old healed in pigment colors and an uneven shape to her brows. It was necessary to “fully lighten n” as much as possible to “color correct” and give a new shape to the brows. 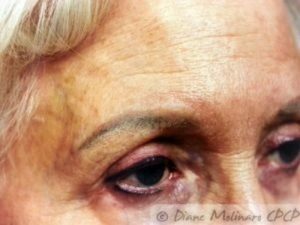 Fortunately, only one “Full Lightening” session was needed to achieve what was needed to yield a new skin “canvas” that a new shape and color could then be applied. 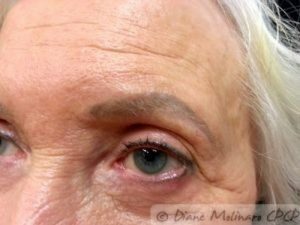 Next example is “Full lightening” of existing pigment. 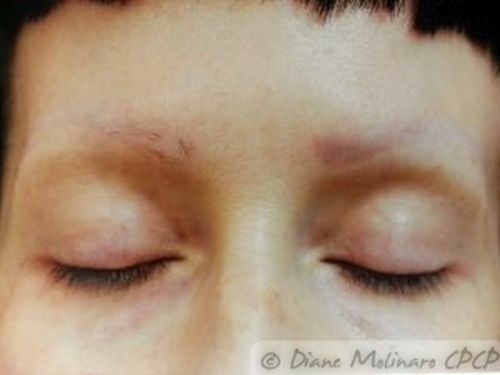 The first is of Eyebrows removal and next example of “Body Art”. Completed photos not available at this time. Both have moved from my area, but both have told me the pigment is gone. Eyebrow removal took 5 times . A 6th was done just to the very front head of left brow only, to remove a tiny bit of greyish haze. It has been successfully, completely removed. 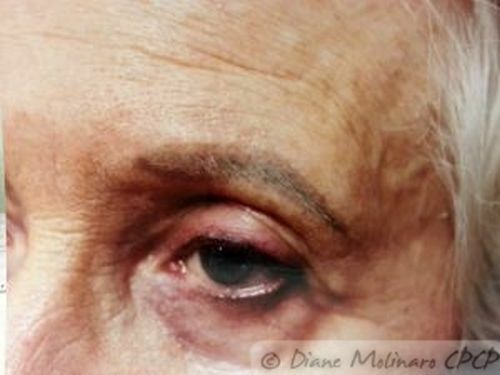 You will also note, a pinkish look to the skin of the eyebrow removal client. Over time that will clarify to a normal skin tone. It can take up to a full year for color to clarify! Body Art removal: The Body Art “Before” was AFTER 7 Laser Removal sessions!!!!!!!! 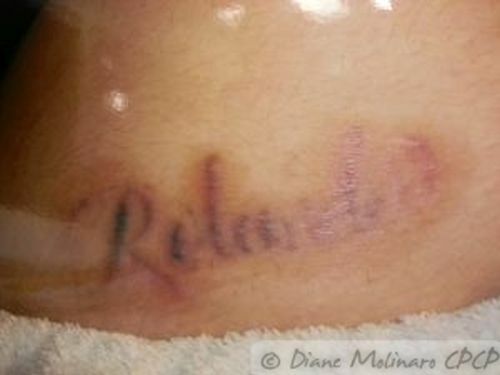 A small area of work was done to the body tattoo after last “after” photo. 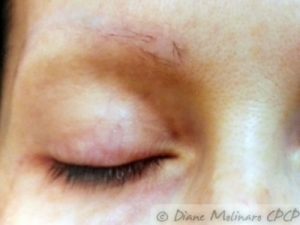 Complete removal was achieved….8 sessions to complete. As you will see, as each session heals, the area shrinks and gets lighter. 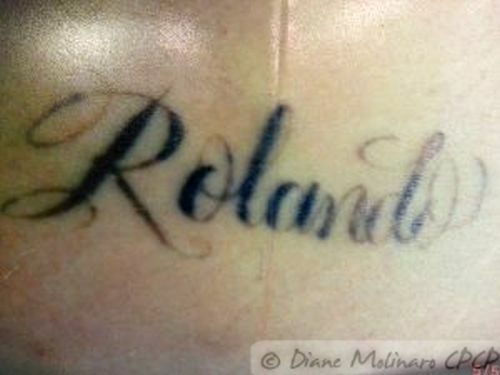 Each session, the tattoo gets smaller and lighter until all existing pigment is gone. Each client is different and will require different approaches to give desired results. Again, a full consultation IS REQUIRED!! Please for your consultation. Help, for what you may think you are stuck with for life, is on the way!! Diane is now a published contributor to the SPCP Quartely Review (spring 2015). Please click here to read/ download a copy.